Last month I pointed readers of this blog to empirical work by Professors Chari, Christiano, and Kehoe (hereafter, CCK). Some commentators claim that new work since then overturns their findings. That commentary is incorrect. To see why, let's review. CCK found that most investment (they offered a rough figure of 80%) is financed without bank lending. I said the same in my New York Times article. The new study does not dispute this finding, which is absolutely fundamental for understanding how the banking crisis impacts us. Second, CCK found an increase in bank lending. The new study does not dispute the increase, but notes its composition: bank customers were drawing on previously established credit lines. While the additional evidence provided is quite useful, please remember that I had already suspected as much. More important, this point about composition in no way refutes the fundamental claim that banks are still lending to many types of customers. "The claim that disruptions to the banking system necessarily destroy the ability of nonfinancial businesses to borrow from households is highly questionable." The data show no decline in bank lending to nonfinancial business. Nonfinancial business are issuing commercial paper at quite low interest rates. The volume of interbank loans continues to be quite high. Now more study has reinforced the conjecture I made a month ago: that bank lending increased because of customers' drawing on pre-existing credit lines. Authors of the new study acknowledge that the data do not prove the existence of a credit crunch beyond a small segment of borrowers, but might well be explained by customers' lack of willingness to borrow. In any case, my prior analysis implies that the backlash against CCK is misguided. First, the real banking problem (from the perspective of the nonfinancial sector) is with settling the old loans, not making new ones. Second, even if the banks' troubles caused them to lend less, you might not be able to detect this with comparisons between Sept-Oct 2008 and prior months, because banks would have been withholding loans much earlier than Sept 2008. Banks will begin to forgive collateralized loans. The amount of forgiveness will decline with borrower income. U.S. employment will not fall below 134 million. Many before me have already explained how the Big 3 do not have the right products, and charge too much for the products they have. Falling gas prices should help the product line problem -- when it comes to large passenger vehicles, the Big 3 have good products. (1) and (2) will permanently lower productions costs by about 10 percent. Permanently lower costs mean permanently lower prices for consumers. Consumers will by more and auto workers will work more, especially in the short run as the stock of American vehicles equilibrates to a higher ratio with foreign vehicles. In summary, union related costs have depressed the american auto industry employment for years. The sooner those costs can be eliminated or passed on to taxpayers, the sooner will be the American auto industry revival. If you make quality parts for GM, a GM bankruptcy is the best thing that can happen to revive your business. A GM bailout, on the other hand, will prolong this period of languid American auto production and only delay the revival of GM products -- and thereby your products -- in the marketplace. Part of BEA's update today of 2008 Q3 GDP is a first release of 2008 Q3 National Income. It includes corporate profits, which permit me to calculate a marginal product of capital for the corporate nonresidential sector. Corporate profits declined less than 1%. Capital income more broadly decline less than 1%. Before this release, my best guess was capital income was "down about 0.6%" Q2 to Q3. I am still making a final calculation of the Q3 marginal product of capital, but a 1% capital income decline is trivial; in order for the marginal product of capital to decline from its recent highs to more normal levels, capital income would have to fall 10s of percentage points. This is quite different from the 1930s: the marginal product of capital was already quite low when the major bank panics hit. Today corporate profits are $1.5 trillion dollars per year and capital income more than $3 trillion per year. That's enough to pay for a lot of investment without banks' help. I was pleased with the first release of 2008Q3 GDP, because it confirmed my prediction that real nonresidential investment was continuing to grow. The BEA has tweaked their numbers; those tweaks have not made any perceptible change in nonresidential structures investment. Thus I can continue to gloat about my prediction success at least until January when Q4 numbers are released! 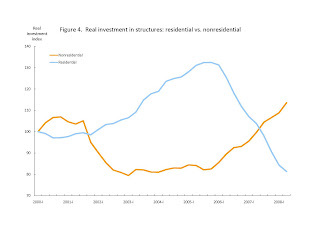 Here is a repeat of my favorite graph showing how nonresidential structures investment continues to rise. Do you remember this entry from 7 weeks ago? I said that housing prices had 27% more to fall. Last month, Luke and I wrote "...as of July 2008 housing prices more to fall in order to reach the real value they had for several years prior to the boom" and that the fall would be about 30% relative to the PPI. Today the Case-Shiller index for September 2008 was released, and its value fell 3% from the previous month and 25% from the prior year. Chicago housing prices have fallen much less over the past couple of months: the Case-Shiller Chicago index has fallen only 2.7% over the last 6 months. Slow rates of Chicago decline are expected because Chicago prices were closer to construction costs, although the rates are so slow that it makes me wonder whether Chicago will ever get back to 1999 levels of (housing price)/(construction cost). Before the election I blogged a couple of times (here and here) about how Democrats and Republicans talk so differently about public policy, but ultimately execute so similarly. My opinion on that matter never pleases anyone, and this election season was no different. Prior to Nov 5, Obama supporters insisted that "any idiot" ought to realize that a President Obama would bring fairness to the tax code, while a President McCain would cut taxes for the rich. At the same time, McCain supporters sternly warned me how commerce would be destroyed by a President Obama's tax-and-spend socialism. Barack Obama promised to repeal President George W. Bush's tax cuts for the wealthy ahead of their scheduled expiration in 2011. It was part of how Obama would pay for an overall net tax cut aimed at low- and middle-income taxpayers, and an effort to bring what he called "fairness" to the tax system. This is an inspiring way of saying "I kind of do things that Republicans would, and they would have done things kind of like I will." And that's good news for the economy. The U.S. Treasury is now creating a massive Unemployment Insurance program: off the books, and without Congressional approval. As we know from decades of observing our friends in Europe, Unemployment Insurance raises the unemployment rate. "Importantly, the agreement calls on Citigroup to take steps to help distressed homeowners. Specifically, Citigroup will modify mortgages to help people avoid foreclosure along the lines of an FDIC plan that was put into effect at IndyMac Bank, a major failed savings and loan based in Pasadena, Calif. Under the IndyMac plan, struggling home borrowers pay interest rates of about three percent for five years. Rates are reduced so that borrowers aren't paying more than 38 percent of their pretax income on housing." In other words, the Treasury mandates that Citigroup forgive homeowners in proportion to their lack of income. As I explained in my latest NBER working paper, this kind of forgiveness is already in banks' private interest, but it is not in the public interest. The Treasury is now reinforcing that socially-counterproductive bank policy. I have worried about this privately for three weeks now. Last week I warned about this on my blog and in the NBER working paper. All other economists have been completely silent on this matter. Goldman Sachs has revised its economic growth forecast. It has been characterized as gloomy, and putting the blame on bad public policy. But let's dissect it. At quarterly rates, GDP growth, they say, will fall 5/4%, 3/4%, and 1/4% from 2008Q3-Q4, 2008Q4-2009Q1, and 2009Q2. That's a cumulative decline of 2.3% 2008Q3 - 2009Q2, or $200 billion, or about $700 per person. Yes, I typed that correctly. Measured in 2008 dollars, GDP is $14.4 trillion per year, or $3.61 trillion per quarter. Based on the annual percentage rates they publicized, we know that Goldman is predicting $3.56 trillion for 2008Q4, $3.54 trillion for 2009Q1 and $3.53 trillion for 2009Q2 (there may be a bit of rounding error here). The cumulative difference between that forecast and zero growth is merely $200 billion, or about $700 per person. I am considered to be the optimistic one, but even I explained last month that GDP could fall more than this in the short term. Our economy can recover quickly from an event like that. The 1930s were entirely different: GDP fell a lot more and the recovery was terribly long. But apparently Goldman and others think that today it is worth spending trillions of taxpayer dollars (thousands of dollars per person) merely to avoid the economy's losing $700 per person. It is a known fact that Goldman Sachs is an investment bank, with a large number of its employees working on Wall Street. It's a known fact that, over the past few months, Wall Street's experience has been far more unpleasant than most other places in America. So it's no surprise that Goldman Sachs would be the gloomy ones, and have a perspective that is not America's. What's more disturbing is that Goldman is both feeding at the Treasury trough and has been successful at promoting an exaggerated state of alarm. "[Freddie and Fannie's] Streamlined Modification Program, set to launch Dec. 15, enables delinquent borrowers to get a modified mortgage that lowers payments to no more than 38% of their gross incomes. ...Several major servicers -- including Bank of America, JPMorgan Chase and Citigroup -- have recently announced expansions of their foreclosure prevention efforts, which could aid nearly a million more borrowers." Some of these one million borrowers are dual earner households, so let's call it 1.4 million = one percent of the U.S. workforce whose incomes are going to be examined. If we take the 108% year-long forgiveness-based marginal tax rate I calculated earlier, plus a 40% tax rate on federal, social security, and state income tax, we have one percent of workforce subject to almost 150% marginal tax rates for a year. That's not pretty, but still not so widespread to reduce employment as it was in the 1930s. But how many other people are anticipating that they will ultimately be plugged into a forgiveness formula like that?! With banks running their own UI programs, Bush's federal extension of UI isn't helping. Nonfinancial corporations are lending too. Thanks Professor Paul Emberton for the reference. Suppose that you bought a house in 2005, and took out a mortgage equal to four year's income. Now your house is worth three year's income. More bad news: you lost your job, and your income is cut in half because unemployment insurance (UI) only replaces that much. Your best course of action may be to FAIL to find a new job. First of all, you can continue UI as long as Congress extends it and you are still without a job. More important, Citi-group is your mortgage lender, and (hypothetically) they are especially willing to renegotiate mortgages with people who are unemployed. That is, by remaining unemployed you greatly enhance your chances of seeing one year's salary (on your previous job) taken off your mortgage. I am not aware of the percentage used by Citigroup, or the frequency over which it measures borrower's gross income for this purpose. For the sake of illustration, suppose that the percentage were 25. An action taken by a borrower to increase his income would increase his payment obligation by 25 percent of the income increment. If an affordable payment were reevaluated monthly, this would amount to a 25 percent marginal tax rate over the life of the loan. If, say, 2009 income were used to calculate an affordable payment for the years 2010-14 and the interest rate were 6 percent per year, then the marginal tax rate would be 108 percent for 2009 (4.3 times the percentage from the formula) and zero thereafter. It is conceivable that mortgage restructuring could do significant damage to our labor market. Notice that this is an issue of settling past loans, not an issue with making new ones. I explain these results in more detail in a working paper (available from NBER or from www.caseymulligan.net/w14514.pdf). This research is ongoing, so please check back here for updates, corrections, etc. Also note that I HAVE CHANGED MY MIND about the damage that deflation could do in today's economy -- it could be a lot via this mechanism. The housing crash is one of the fundamentals our economy inherits from the past. This is boom time for the nonresidential sector because, after a long wait, the housing sector no longer absorbs so many resources. If you are young with new business ideas -- good news: you no longer have to compete with the housing sector for funding. Although business capital and GDP will grow (my detailed predictions are here), old capital has to compete with the new projects. That's part of why the stock market falls when we learn that housing investment is lower than expected. The chart below is from my NBER wp "Market Responses to the Panic of 2008" showing how housing investment appears to discourage non-residential investment. Although banks perform an essential economic function - bringing together investors and savers - they are not the only institutions that can do this. Pension funds, university endowments, and venture capitalists and corporations all bring money to new investment projects without any essential role played by banks. The average corporation receives about a quarter of its investment funds from the profits it has after paying dividends - and could obtain even more by cutting its dividend, if necessary. Note that the funds referenced here are flows, and are distinct from the value of institutions that own them. A business needs cash flow -- from its own operations or some other institution -- to pay for investment. The value of the institution is only on paper. For example, a startup company could have tremendous value but no cash flow (or negative cash flow) from its operations and therefore needs outside funds to invest. Conversely, many corporations, pension funds, endowments etc., today have suffered losses in value but nonetheless have significant cash inflows from their investments and operations. Those adverse changes in no way refute or de-emphasize my point. Indeed, Luke Threinen and I predicted both reduced values and increased investment funding. Its poor cash flows that will get my attention. The importance of flows is why I keep an eye on aggregate capital income in the economy -- the marginal product of capital -- and not the aggregate capitalization of the stock market or some other valuation measure. Aggregate capital income was low during the years prior to the 1930s bank panics; so far those flows are fine today. "we should be careful not to extrapolate the rate of economic growth measured through September 2008 into the future. We should also be careful to evaluate economic growth measured FROM September 2008 with the understanding that some "rebound" is to be expected as factories clean up after a hurricane or strike." "Industrial output posted a bigger-than-expected rebound in October after plunging in September by the largest amount in over 60 years. The Federal Reserve said Monday that industrial output rose 1.3 percent last month, reflecting a return to more normal operations following hurricanes and a strike at aircraft manufacturer Boeing Co. the previous month." Keep this in mind when 2008 Q4 growth comes out. This is supposed to be a serious blog, but I will permit some levity on the occasional Friday. Thanks to Angela for recommending this song. A month ago the Treasury floated the idea of its purchasing equity stakes in banks, and I first explained how Treasury investment would crowd out private investment. Academics had ignored this point, and largely still ignore it. Suppose the Treasury bought bank shares in the open market. That is, they traded cash-for-shares with existing shareholders. Why would those shareholders take their newfound cash straight to bank they had previously owned and ask for a new share issue? Professor Barro says that the shareholders would save their cash for future taxes they'll owe, but at the very least might we expect that they'd spend the cash on a variety of other things? In that case, the bank in question would have little or no increase in shareholder equity. The actual Treasury transactions were not with shareholders, but with the banks themselves -- a trade of cash for new share issues. But why should it matter whether the Treasury deals with the banks or with the bank's shareholders? If it doesn't matter, then we are back to the conclusion that Treasury transactions do not boost shareholder equity. First, the Washington Post and two Harvard Professors noticed that banks were not cutting dividends despite their massive losses. Dividend payments are one way to neutralize the Treasury purchases. Second, reporters noticed that PNC financial took its Treasury cash and immediately bought National City Bank. Third, reporters heard that JP Morgan Chase CEO told his employees that Treasury cash would help them acquire competitors. All of this in only a few weeks! And I had worried that it would take years of careful academic study to prove my point. Read all about this in my new Economists' Voice article "Is the Treasury Impotent?" Despite (or because of?!) the evidence that Treasury investments are not helping capitalize banks, Professor Mankiw still thinks they are a good idea. Would the Treasury be Equally Impotent in the Auto Industry? Some members of Congress are encouraging the Treasury to include automakers in the banking sector bailout plan. I don't yet know the details. But let's work through the effects of (so far, hypothetical) Treasury purchases of newly issued GM stock. GM suspended its dividend earlier this year. But it could reinstate it, which would push some of the Treasury dollars out the door, at the rate of about $0.5 billion per year. GM could use the cash to buy another automaker. That would put more Treasury dollars in the pockets of shareholders (of the other automaker). GM could spin off GMAC to its shareholders. That's not cash in shareholder pockets, but some valuable shares. Do not take for granted that (hypothetical) Treasury purchases of newly issued GM stock would significantly change the organization of the industry by reducing the probability of bankruptcy. Absent Treasury action, GM would likely end up joining with another automaker. All the Treasury action might do is let GM be the acquirer rather than the acquired. There are fraudulent conveyance laws: GM cannot sell its valuable assets and then declare bankruptcy. Thus, Treasury cash would enable GM to spin off GMAC only if GM kept enough of the Treasury cash to avoid going bankrupt too soon after the spin off. If bankruptcy were the only way shareholders could free themselves from obligations to unions and retirees, then bankruptcy may happen regardless of whether the Treasury gives cash. Obviously, more analysis is needed here, but this time let's be quicker to admit that Treasury cash will not stick where it lands. A variety of economists have been debating the role of fiscal policy during the Great Depression. Some of them (also here) seem to suggest that things would have been much different if income tax rates had been lower. Although many things can be blamed on income taxes, the Great Depression is not one of them. The reason why it's hard to blame much on the income tax is quite simple: most people did not pay any. There was not even withholding in those days. You may have seen some reports about the "lowest income tax bracket" during the 1930s was rising, but that ignores the most prevalent bracket of all -- the zero percent bracket! I have toyed with the idea of putting some blame on property taxes -- property taxes were hefty, but I don't yet see the mechanism. Citigroup announced today that it would renegotiate home mortgages as part of " sweeping efforts to try to curtail losses from souring mortgages." I think deflation is unlikely. But if it did occur, its harm would be limited, in part because (unlike the 1930s) mortgages are being widely renegotiated in light of the new economic situation. Renegotiations like that could readily account for deflation-induced reductions in homeowner incomes. Will the property tax assessors now do their part? Shocks to the Production Set. A larger production set can increase housing prices, and is an aggregate wealth effect by any definition. The wealth effect calculations I made with Luke Threinen are most easily interpreted in such a model, although they can also be interpreted as the result of redistribution created by separable taste shocks. "Distortion" shocks that move the economy closer to the frontier of the production set. Increasing housing subsidies can both increase housing prices and look like an adverse wealth effect from the perspective of household behavior in the non-residential sector. Nonseparable taste shocks may have similar effects. Changes in the production set or changes in the distance between the market allocation and the production frontier involve wealth effects by any definition. An example: the arrival of information about the technology for producing housing services. People may learn that the technology will advance, which causes a boom in housing prices and a favorable wealth effect. The market may initially believe that banks can streamline the mortgage process and thereby facilitate home-ownership for small home-owners. Or it may believe that the real estate brokerage industry will become more productive. Good news like this boosts housing prices and is an aggregate wealth effect. If the market later learns that ultimately the technological advance will not work (e.g., learn that small homeowners are really more expensive to service than initially thought), housing prices crash and there is an adverse wealth effect. This conclusion might appear to disagree with Buiter (2008), which argues that changes in housing prices are not wealth effects in the sense that they do not enter the demand for non-housing goods because housing is both an asset and a consumption good. Buiter emphasizes that someone will consume the housing stock – even if it isn’t the current owners – and those prospective consumers gain from a housing price crash even while the current owners lose. I agree that housing prices changes that reflect changes in the current or expected future (separable) preferences for housing are ultimately redistributive. Demand changes are not changes in the production set or changes in the distance between the market allocation and the production frontier. But it is quite possible that the shocks that created the housing boom prior to 2006 and the housing price crash that followed were technological or public policy driven. A technology shock will have aggregate wealth effects, and a public policy shock might too. Another question is whether the persons short housing are represented in today’s economy (maybe they are unborn, or live abroad, or only exist in the imagination of exuberant housing investors), but my purpose here is not to reclassify a redistributive wealth effect as an aggregate one. Gerontocracy Stumbles: The Real Political News This Year? Much of the world has lived under gerontocracy since the 1970s. That is, countries throughout the world -- democracies and nondemocracies alike -- have awarded much of their tax dollars to programs for the elderly. Social Security -- which writes checks to the elderly -- is the largest federal program in the U.S. The second largest is Medicare -- a publicly-funded first-class medical insurance program for persons aged 65 and older. Medicare is on its way to becoming the largest federal program, and not because Social Security is shrinking. Outside of the U.S., many governments spend even more of the national income on programs for the elderly. In some Western European countries the elderly receive from the government (not to mention their receipts from private sources) a fraction of national income that exceeds their fraction of the population. In those places, the elderly had already proven that their share of need placed no limit on what they could obtain from the public treasury. Only three years ago, the march toward gerontocracy seemed unstoppable. Elderly programs had been growing for decades, and seemed destined to grow further as the baby boom retired. President Bush -- the leader of a Republican party that supposedly believed in "public spending control" -- signed the expensive Medicare Prescription Drug Act with much fanfare. The political landscape couldn't have been better for the elderly. They were healthier than ever, selling their homes to young people at high prices, and cashing dividend checks from sizable stock portfolios. Most important -- and thanks to the above -- the elderly enjoyed long retirement periods that permitted them to devote time and attention to important political issues. As they prepared to welcome the baby boomers to the retirement class, they could expect to add numbers to their politically robust ranks. To add to the euphoria, Senator McCain helped pass campaign finance reform , which put financially-funded political groups at a further disadvantage relative to grass-roots organizations. It's no accident that the AARP enthusiastically endorsed that reform, because the elderly don't lobby with money -- they influence political change with time and attention. 2008 did not stop the aging process for the baby boom, or for anybody else. However, the stock market and housing crash delayed many retirements. With many of the baby boomers remaining in the workforce with the young, it is less likely that they will identify with retirees. Even if they do, work will keep them busy -- maybe too busy to pay much attention to political matters. This year also witnessed significant innovations in political fund raising, with much of the credit going to the Obama campaign. The previous campaign finance reform ultimately did not stop the collection and disbursement of hundreds of millions of political dollars. The young survive to fight another political day, and to do so with more numbers and dollars than we previously expected. Democrats and Republicans clearly have different rhetoric. But rhetoric is not policy. Republicans talk a great game when it comes to cutting government spending, but President Clinton's administration had one of the lowest ratios of government spending to GDP. President Bush added immensely to Medicare spending with the Prescription Drug Act. Democrats talk a great game about helping the poor, but they pushed through a bill to tax America in order to bail out Wall Street fat cats. FDR started Social Security, but Nixon did the most to increase its spending. Democrats talk about limiting the power of the state when in comes to the death penalty, but a Republican Governor (Ryan in IL) put a moratorium on the death penalty. Professors Snowberg, Wolfers, and Zitzewitz tried to look at situations in which party-in-power was significantly different even when citizen preferences were not. They found some effects, but they were also quite small. Eg., a Bush administration (rather than Kerry or Gore) was expected to increase stock prices by 2-3%. That is pretty trivial, given that the stock market fluctuated that much in the 20 minutes it took me to type this entry. The Federal government currently spends about $9000 per capita per year. Even if I applied the estimates from the states (which I think are too big because national elections are more competitive), that means a victory for Obama (McCain) AND the Congressmen of his party will increase (decrease) federal spending by $90 per capita per year. Regardless of whether you like or dislike public spending, $90 is not worth much worry. I am aware that I wrote an article showing how women's relative wages increased over the years, but essentially did so only during years of Republican presidents. But I don't know (yet) whether or how that progress can be attributed to public policy (more on the women's wage issue here). P.S. How much would did (would have) an Obama victory cost? The $90 upper bound pertains to both executive and legislative victories by Democrats. Obviously, Obama is only part of that. Furthermore, some of the $90 would be a pure transfer. On the other had, deadweight costs may be created both from the taxation and the spending of the $90. I would say less than $50. For those who are voting tomorrow (or, like me, voted already), I hope you enjoy(ed) the experience. The election outcomes will be the same regardless of whether you vote or not. If you vote, your favorite candidates will have one more vote than they would have had if you had not voted. But your candidate won't need just one more vote, except in the highly unlikely case that your candidate ends up tied or losing by just one vote. A U.S. Presidential election has never come down to one vote. The Bush-Gore election was pretty close, and some say that Gore really won, but all admit that the Bush and Gore votes in the pivotal state of Florida differed by hundreds. That is, even if you are a Floridian and had voted differently that day, Bush would still be the President. A U.S. Senate election has never come down to one vote. A Governor's election has never come down to one vote. Chip Hunter and I used a computer file with vote tallies from over 70,000 general elections to the U.S. House, state Houses, and state Senates (read more in the June 2003 issue of Public Choice). Most notable are the large number of uncontested elections (that is, elections for which only one candidate is on the ballot). I can guarantee you that an uncontested election will not end up tied! Are there any readers who voted in the 1910 election in the 36th Congressional district of New York? Those are the only persons having the privilege of voting in a U.S. House election that came down to one vote. 6 state House and 3 state Senate elections came down to one vote; the other 40,000+ did not. One of every 89,000 votes cast in U.S. Congressional elections, and one of 15,000 in state legislator elections, "mattered" in the sense that they were cast for a candidate that tied or won by one vote. Most economists have a bleak outlook for next year. Their expectations are very different from mine. They forecast less consumption. I forecast consumption to be below trend, so we more or less agree on that. Where we disagree is on business investment. They make a big deal about banks' (supposed) not lending. I emphasize that investment resources have been freed up from the housing and consumption sectors and are now available for business investment. They claim that employment will fall markedly. I emphasize that baby boomers will delay their retirements -- which has the opposite effect. I emphasize that forecasts like theirs are logically inconsistent with the commentary given about the housing boom -- commentary given by many of the same economists. Many economists have much more experience with forecasting than I do. IMO, their forecasting models are not appropriate for today's very unusual situation, even though those models may have worked in the past. Today's situation is when an academic economist's opinion is needed -- that's me. My short track record is pretty good. Without much company, I correctly predicted that the Treasury stock purchases would be neutralized by bank financial transactions. Also without much company, I correctly predicted that non-residential structures investment would actually grow even while residential structures investment plummeted. I also predicted that housing prices would continue to fall, although others also predicted this.